In my blog from yesterday, on Sinatra's Stamp ceremony at Bellagio Fountains, I talked about Frank's love of "5 O'Clock Vegas Blue"... referencing the colors of the skies here. I also mentioned that he was one of the main characters for making Las Vegas what it is today, and influencing it's growth. If you can get past the 'Old Blue Eyes' and then the beautiful Dancing Fountains of Bellagio, in some of the pictures you may have noticed that Frank's influence to the growth of Las Vegas still goes on today. In the backdrop of those amazing blue Vegas skies you'll find a sea of cranes marking the building boom going on, the largest in Las Vegas history. Not only for the tens of millions of visitors that follow Frank's lead to the place to relax and unwind, but also the new residences along the Vegas Strip. I did a quick walking tour to show just a little of the construction, and if you haven't been here for a while, some of the existing and recent additions to the Strip skyline. Flanking the Bellagio Fountains on the left is MGM's $9.2 billion Project City Center and $3 billion Cosmopolitan that are underway. Today the first building in City Center, the Vdara Condo Hotel will be topped off. MGM's city within a city is scheduled to open in November 2009. Hiring for the staff of 12,000 will begin in early 2009. This image only shows a small portion of the 76+ acre project. 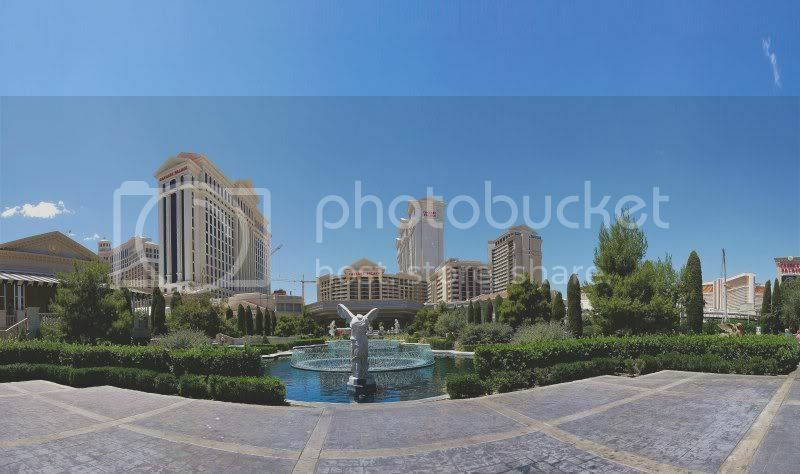 On the other side of the lake, just across Flamingo is the Caesars Palace Augustus Tower that opened in 2005. The cranes to the left are for the under construction $1 + billion Octavius Tower that is also scheduled to open in 2009. 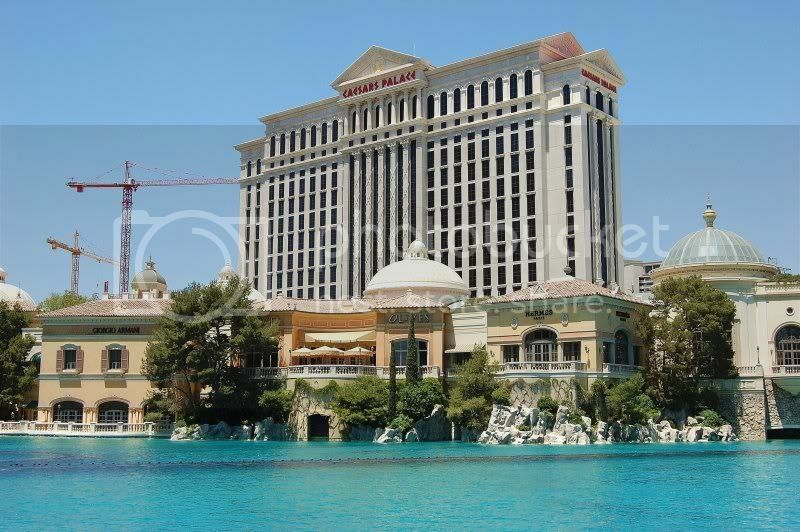 The front of the Caesars property will also be undergoing some building, expanding in both width and height, along with their Convention Center expansion and 3 new pools. Here's a wide angle view of what it looks like today, but the changes will also be happening by 2009. Just north on Las Vegas Blvd. 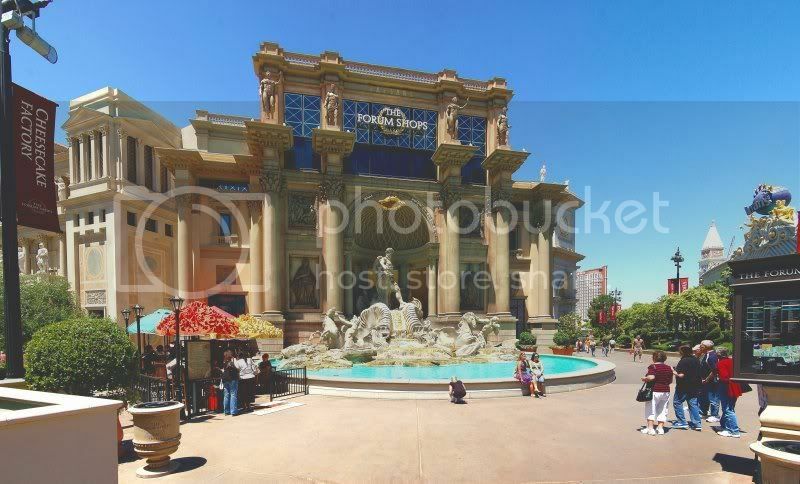 is the expansion of the Forum Shops that has an entrance right off of the Strip across from Harrah's. This is just one side of the addition, if you haven't been here in a while. 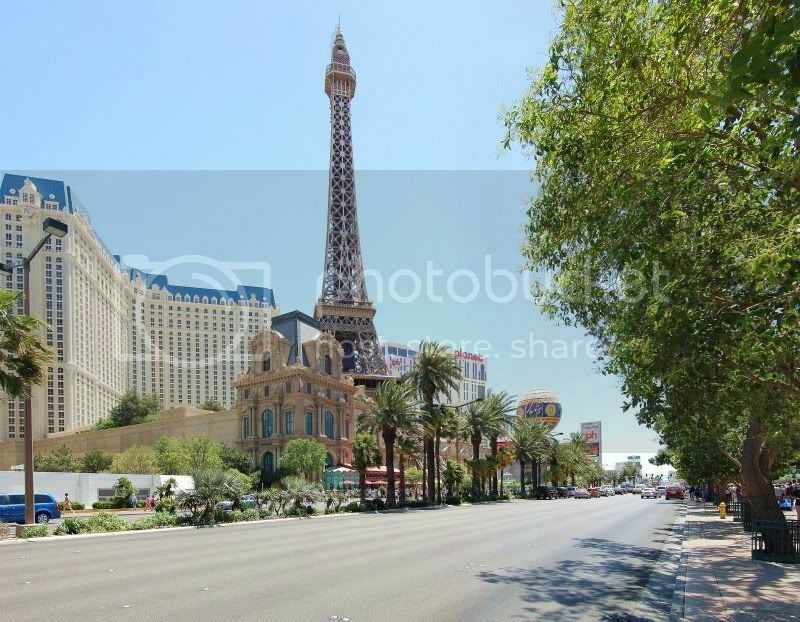 Across the street from Bellagio is Paris Las Vegas and the former Aladdin that has been redesigned as Planet Hollywood. The former Desert Passage of Aladdin is now the Miracle Mile Shops and is under renovations. Behind that is the under construction Planet Hollywood Condominium Towers, and a new 20,000 seat AEG Arena is being developed behind Paris and Bally's. 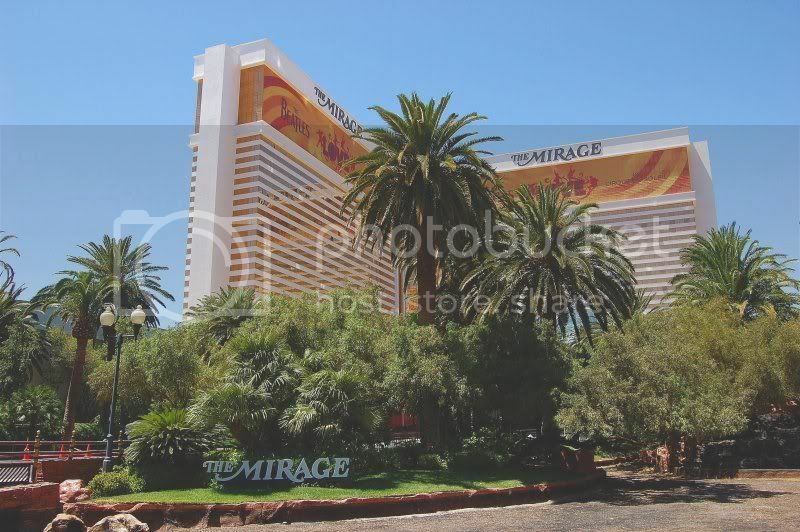 Back up the street to the north and next door to Caesars is the Mirage. There has been ongoing work there as well, from rooms to restaurants, and even the massive aquarium behind the front desk has been redone. At the moment the volcano in front is drained and crews are busy adding the latest in sight and sound special effects to make the 'eruption' more spectacular than ever. It's scheduled to reopen in late 2008. Across the street is the Venetian, and it's recently opened Palazzo. The combined properties now have over 7,000 rooms, and they're still building as you can see from the crane on the right. 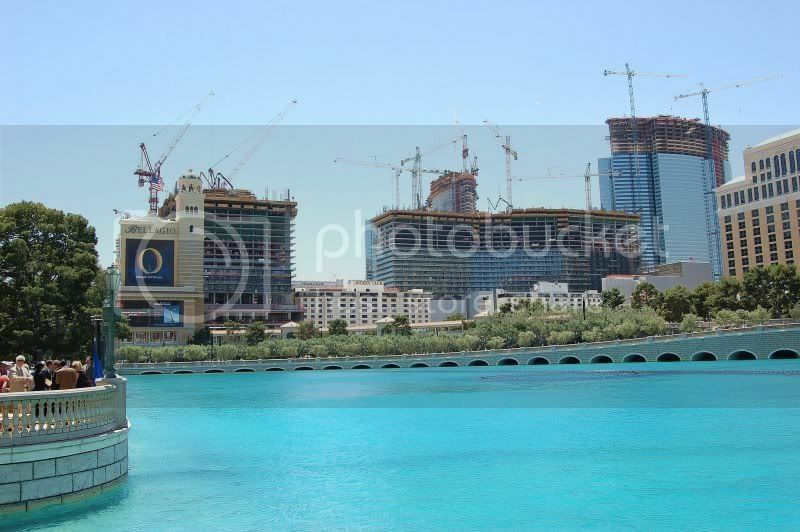 There is also a condo tower being built behind the Palazzo between it and the Venetian. The next phase that's already under development is to build a new Sands Convention Center on property they own further down Sands Ave., then adding additional towers in the location of the current Sands Expo. 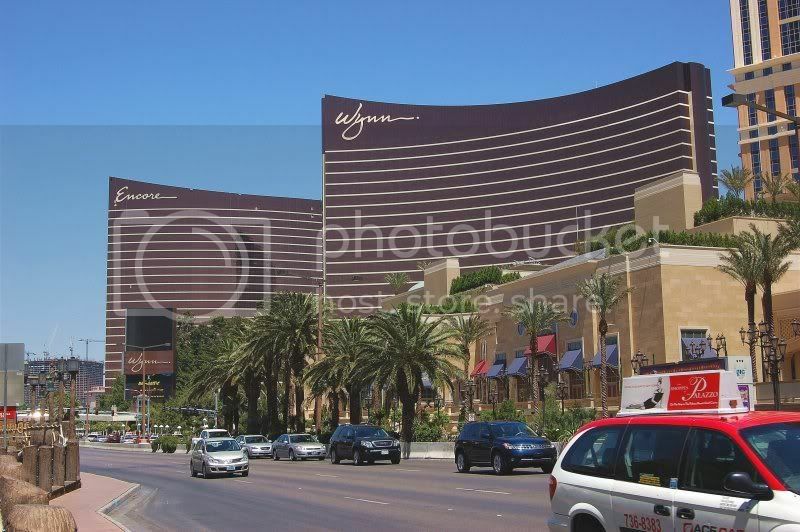 Across the street from Palazzo is Wynn Las Vegas where Tina and Nancy Sinatra went after their father's stamp events. Steve Wynn was a close friend of Frank, from his days of Frank headlining at Steve's Golden Nugget downtown. 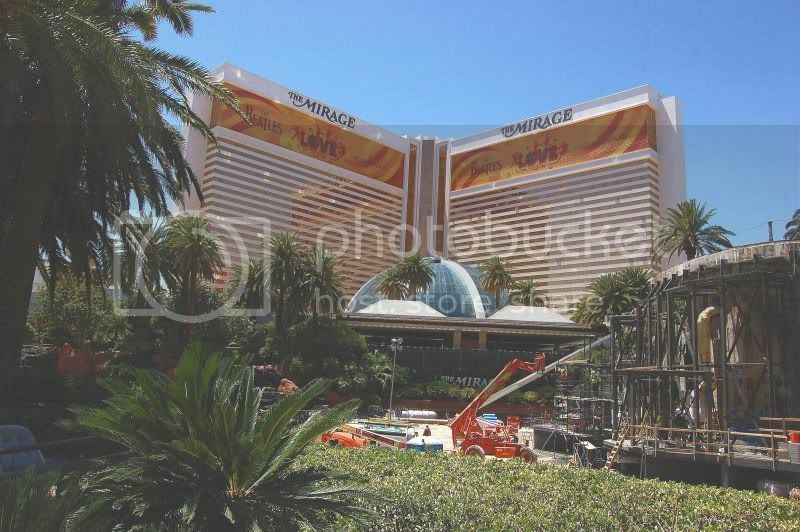 As you can see Steve's latest addition, Encore, is well underway and is scheduled for a Dec. 15th 2008 opening. In the background to the left you can catch a glimpse of the under construction $2.8 billion Fontainebleau as it rises above the Riviera. 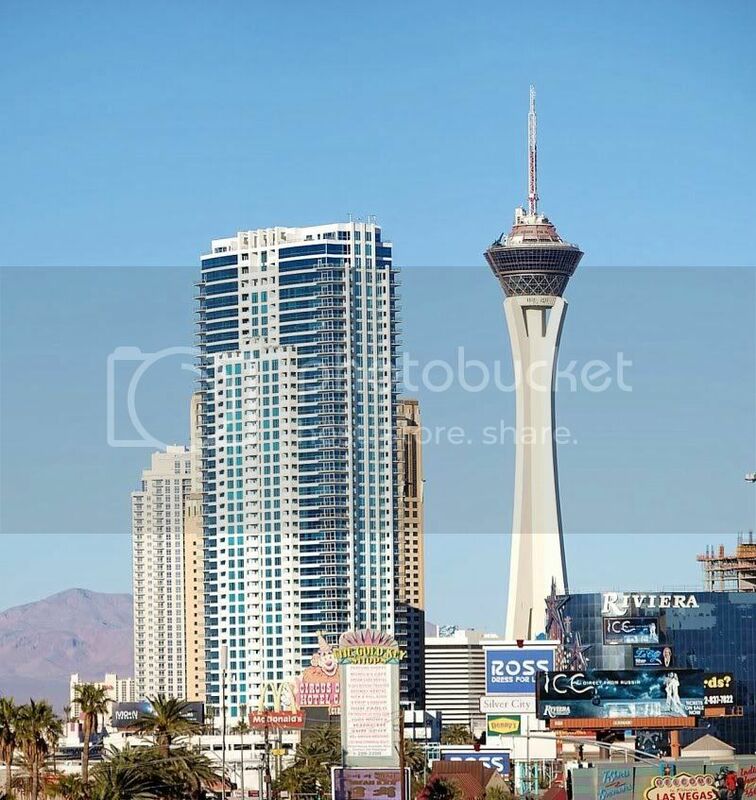 Just down the street you can see some of the development on the north Las Vegas Strip, including Sky Las Vegas and glimpse of Allure Condominiums behind it on Sahara and Fontainebleau beginning to rise above Riviera, next to Turnberry Towers. 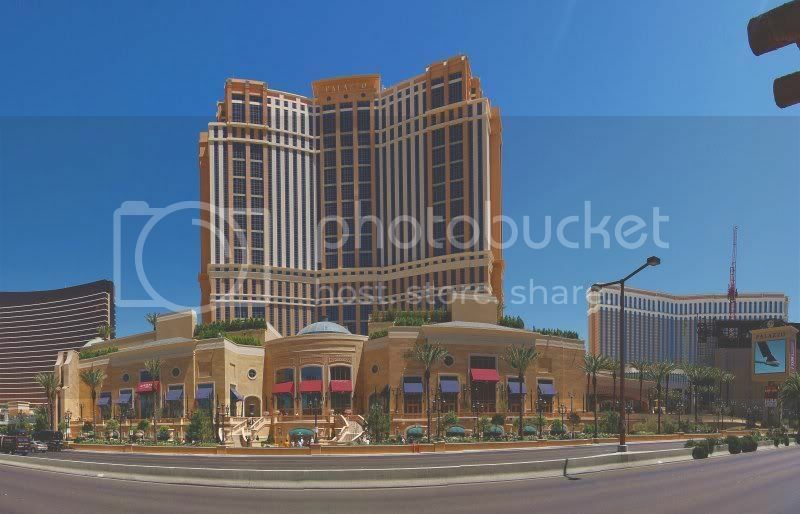 The Sahara hotel is also going to demolish and rebuild one of it's hotel towers, and across the street architectural work is being done for a joint venture project of MGM and Kerzner International, owner of Atlantis Bahamas and many other resort properties around the globe. Just behind the palm trees in the left forground, work is underway on Echelon Place, a $4.8 billion project on the site of the former Stardust. Next door to that is where the former New Frontier property has been cleared to make way for the $5 billion Plaza Hotel and Condo project, currently expected to start in 2009, and it's next door to the recently opened Trump Tower. This is just a small sampling of the recent additions along the Las Vegas Strip, and what is yet to come. I have more Las Vegas construction photos in a slideshow, that include McCarran Airport's Terminal 3, Hard Rock on Harmon and Paradise Rd., and more of City Center and others. Those can also be viewed full screen. There is more being built all through the Las Vegas and Henderson area, with the opening of Cannery East Casino on Boulder Highway and Aliante Station in North Las Vegas this year. In Henderson, the M Resort is well underway by the son of construction giant Anthony Marnell, who was also the former owner of the Rio. The construction doesn't only include resorts and casinos. Currently under construction is the 61 acre Union Park in Downtown Las Vegas. In addition to the World Market Center that is already open and continues it's build out, the Premium Outlets and the Clark County Government Center and Amphitheater, there will be new additions including the World Jewelry Center, Lou Ruvo Brain Institute and Access Medical, The Smith Center for the Performing Arts and Symphony Park, and long with retail, hospitality, and residential in this new urban setting. It doesn't even stop there, with continued commercial building along the Las Vegas Beltway and other areas throughout the Vegas Valley. It's really no wonder that so many new and exciting residential areas are growing in suburban Las Vegas. I've blogged and have posted pictures of just a few so far, including Tuscany Village, Toll Brothers at Inspirada, Anthem and Madeira Canyon, and Mountain's Edge, and that is only a small sampling of what is available. (I have more pictures from my buyer previews and will be adding them as time allows, but of course my clients have to come first.) There are many others around the valley that offer a wide variety of lifestyles and amenities, all within reach of the plentiful recreation throughout the area. All of this within a short drive to The Entertainment Capital of the World, the Las Vegas Strip with all it's events, shows, nightlife, dining and shopping. A vacation escape for a hours or days is always just a few minutes away. Wow, those are great photos! Are prices still low there? Wow! Vegas is so amazing. My wife was just there for a Bachelorette party last weekend, but she didn't mention all of this new construction. I can't wait to go back. Keith: Glad you like the pictures. Yes, there are still exceptional values here, and I know personally I've been getting a lot more activity. That seems to be the story Valley wide, with the last 4 months showing gains. Kevin: She was at a Bachelorette party and you wonder why she didn't notice construction? LOL Yes, it's really amazing to see everything change. It's NEVER boring around here, that's for sure. You'll have to plan a trip. 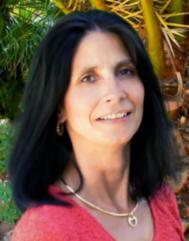 Check out Sparky's links in my sidebar, there may be something helpful for you there. WOW Roberta! Great Pics! It amazes me how much Las Vegas has changed from the first time I was there in 1986!!! It a great place to visit or to live. Steve: Yes, it has changed a lot since 1986! It has changed a lot since we moved here 5 years ago! It is a full time job just keeping up with everything! It just keeps getting bigger and bigger - I wonder if the casinoes are doing better in a down economy? Enjoyed reading this informative post. Will visit Las Vegas in June for the first time. Looking forward to seeing the sites in person. Great pictures. Tom: Yes, Las Vegas does keep growing. No, the casinos aren't doing any better in this economy, but that is due to the high cost of gas, airline going out of business and cutting flights and the decline in conventions from businesses tightening up in a soft economy. Although, most of that is being offset by foreign travelers. Speaking of getting bigger, MGM announced today that City Center will now cost $9.2 billion! Yvonne: Thanks! You may want to check out the Sparky site (click on the dog in Elvis costume in the sidebar) for more Vegas information and coupons. Hope you enjoy your trip! Wow, these are amazing photos. Last time I was in vegas was probably 1989? I stayed in the Dune HOtel before it was blown up! Did you take these photos yourself? If you haven't already you should post them on localism. Bo: You need to visit again! A lot has changed since 1989! My husband actually takes the pictures and does a great job! Very nice!! When we lived in 29 Palms CA we would go to whenever we could! We love Vegas! Were married there and celebrated each deployment homecoming there and lots of visits in between - your photos are awesome! Now that we aren't within driving distance we haven't been for a year and we are missing it!! Kelly: Glad you enjoyed the photos! Jo: You need to jump on a plane and visit soon! There are a lot of changes. Thanks for the comment! Roberta - These are amazing pictures. Very nice job! We need to get back to Vegas... it's been a while since we were there. Jesse: Thanks! A lot has changed so you should visit again! Kevin: Vegas is beautiful! Glad you enjoyed the pictures. Thanks for the update. I have been visiting LV for 25 years or so. It's a great convention town, but I will admit to having vacationed there relatively recently in the form of a family reunion. It looks like all the "oldies but goodies" are undergoing updates. Vickie: Yes, a lot of properties are undergoing changes but that is one of the things that makes Las Vegas so attractive! I came across you post late at night and you have some great pics, did you take them? I have lived in Las Vegas for 7 years now and worked on many Casino Projects and yes Las Vegas is changing so fast that when people come here after many years away, they can not beleive their eyes. Let's get together sometime soon and (Talk Real Estate). GREAT pics, and I haven't been there in 3 years (3 lifetimes in Vegas). My wife has a biz trip at the end of June. I'm toying with going with her, and our 18 year old girl graduated HS this year. Think about bringing her as well. Should I get a map???? Robert: Thanks for stopping by! Glad you enjoyed the pictures! Greg: You and your daughter should take the trip! Vegas has changed in the past 3 years but you probably don't need the map unless you are going off the strip to enjoy all the other attractions in the area. Since everyone enjoyed the daytime Strip, I guess I should show you what it looks like at night. I posted the link to this panorama a few months ago from my ace photographer, but just in case you missed it, here's the Las Vegas Strip view at night from McCarran airport to downtown. You can click on the X in the bottom toolbar for full screen, and can drag the image with your mouse. I didn't realize how much the strip has changed in the 9 years since I was last there. WOW, I need to get back there! Todd: 9 years??!! It is time for a visit again! Roberta, WOW, what amazing photos. Very nicely done. Thanks for sharing these with us. Great pictures! Vegas always continues to evolve into something new. It's always fun running around in Vegas. Gary: Glad you enjoyed to photos! Cheron: Thanks! Vegas is a very exciting place with things constantly changing.